Are you a competent manager? What skills do you need for success? leadership? management? facilitation? communication? negotiation? innovation? arbitration? coaching? supporting? I would say you need all of these. Plus a lot more besides. But these in and of themselves are not sufficient! Here is the starting point: there is one fundamental aspect that you, as a manager, must focus in on to be successful as a manager. Your success as a manager requires that you have a high performing team. At the end of the day your manager won’t care how well you led, managed, facilitated, and so on. She or he will care how well your team performed. But how well you have led your team determines how well your team will do, right? Not necessarily! I know, it sounds counterintuitive, but there are some dynamics in organizations that create situations where you simply cannot get the most out of your team, no matter how well you lead or coach them to lead. In this article I will give you some insights that will fundamentally change the way you look at and manage your team. It’s one of my longer articles, but bear with me. All three of these are important and must be balanced. You have to keep the shop running. You need to deliver on projects. And you need to manage your team. Sadly, in my observations as a management consultant, the hours typically run out every day before most managers get to the managerial leadership part of their role. And while almost all would agree that this is important work, it is the least urgent and the easiest to put off until tomorrow. What is the Single Most Important Requirement? The single most important thing a manager can do is ensure that the team is operating effectively and cohesively. This means that each team member must be operating effectively in their own three categories of work (day job, projects, and managerial leadership). They also need to be working collaboratively with each other to ensure appropriate mutual support and handoffs within your team. So your success depends on each member of your team being successful, and your team as a whole being successful. Right column symptoms are typically seen as competency issues. The Left Column top performers are rewarded, and the others are coached and trained with often short term and limited results. Typically as a manager you will start to delegate more narrowly with less complex work until they can meet these lower expectations. This comes at a cost – the cost of a high performance organization. Imagine what you could accomplish if all of your subordinate managers were in the left hand column! In fact, there are two related root cause issues that create these situations. Understanding these can help you to take action that can significantly increase your team’s performance. Work in each layer of an organization is different in many ways, but complexity of the work is the key differentiator. Think about work at the front line, or Level 1 work. It is driven by procedures. Workers come in for the day, are assigned their work, do their work, and then go home. There is a finite solution set for problem resolution. If the possible solution is outside of the procedure, it needs to be escalated. The next level of work, at Level 2 is professional work and Front Line Management work. This work requires gathering information, diagnosing issues and implementing solutions. There is an infinite number of solutions for a given problem, so work focuses on gathering appropriate amounts of information from a wide variety of sources in order to determine the best solution. At this level the procedures used by the front line are developed, managed and improved. This is also the first level of management, where this diagnostic capability is used to manage and improve the performance of front line employees. Third level work in an organization is accountable for groups of Front Line Managers and Professionals. It is typically concerned with the smooth operation of the work within the function. With the typical title of Director or Senior Manager, these positions are accountable for work that may take 1 – 2 years to complete. It is necessary to build serial paths into the future, doing one thing so that another thing can be done which will lead to the third thing. This differentiations of Levels continue up the organization – Elliott Jacques has identified 8 distinct levels. There are two very important points here. First, the nature of work in each level of the organization is different, but organizations often do not recognize this. For example, a Level 3 position may be assigned workers from both Level 1 and Level 2. Second, an individual in each layer requires a manager exactly one level above, because they need someone who is able to add value to their work. Level 1 workers reporting to a Level 1 worker will not have anyone with the diagnostic capability to solve problems arising from issues with the proceduralized work. This applies at every level of the organization right up to the CEO. Read more about Complexity of Work. The second concept has to do with Human Capability. People that are assigned to do the work at a certain level, must have the capability to do the work of that complexity. In the Effective ManagerTM methodology we refer to the capability of individuals to work at different levels of complexity as Problem Solving Capability. This derives from Elliott Jacques excellent work on mental processing capability, which describes the way in which individuals solve problems. As people age, they go through a natural maturation process. Physically, they grow in height, put on weight, go through puberty, and so on. The mind matures as well with respect to how it processes information. Jacques categorizes eight different stages an individual goes through in the mental maturation process. And in the same way there is an end to physical growth, there is an endpoint in maturation through these eight different mental stages. Unfortunately, what tends to happen in organizations is that when someone is really good at producing results in a particular position, there is a natural tendency to want to promote them. If they haven’t matured sufficiently and lack the necessary problem solving capability for the next level, they will likely fail. Essentially, you can be taking your best Manager and turning her or him into your worst Director. Despite being exceptional at their current position, without the capability to solve problems at the next level of complexity, employees will not excel. It is critical that Problem Solving Capability is understood to ensure success. Read more about Problem Solving Capability. Most organizations are not very good at aligning their positions by complexity of work. As a result, people who are quite capable of doing the work at their level, may be reporting to a manager that is 2 levels above them. I see this in financial services organizations all the time: front line agents, working within procedures, and professional agents, using diagnostic capability to do their work, are all reporting to the same Level 3 person. In these situations some people will be working one level down at Level 2 and will perceive that their manager, one level up, can add value to their work. These are the left column people. But some are two levels removed from their manager, working at Level 1. Even though they may be competent at their work, from the perspective of the manager, they are right column people, because they do not have the capability to work at the next level up. They require a Level 2 Manager for success. While we have drawn this figure for a Level 3 manager, this situation exists in many parts of the organization. 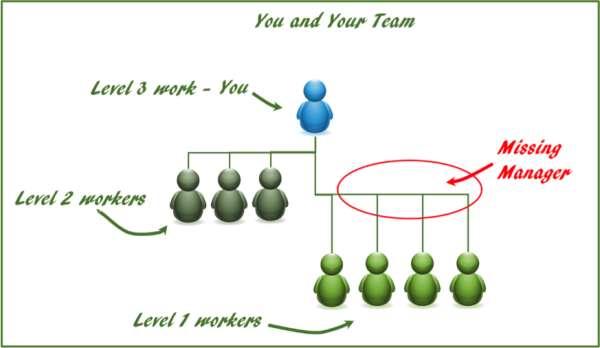 Organizations also have a tendency, when filling a vacancy, to promote the highest performing person on the team to become the next manager of the team. The result – someone without the Problem Solving Capability at the next level is promoted to the next level. The former peers will soon rightfully perceive that this person is not adding value to them, and so see this person as the “real” boss. From your perspective, as this person’s manager, you will see them as right column people, because they are not taking the initiatives you would expect at their newly appointed level. They will prefer to work where they can succeed – one level down – to the consternation of their subordinates whose work they are re-doing or duplicating. Being aware of these structural issues can help you avoid wasting time and effort on training that will not take. It is not possible to train someone to the next higher level of capability. Problem Solving Capability is a maturation process – just like growing to a certain height – it cannot be trained. Certainly there are other factors that may be at play. Capability may be there but not skills. Capability and skills may be there but the person may not apply themselves to the managerial work. The important thing is that you diagnose the root cause and work at that. Don’t try to coach or train your way out of a systemic issue. There are things you can do to resolve or mitigate these issues – they will be the subject of a future article. For more information you can watch the recorded Webinar elaborating on this topic. Managerial success requires high performing teams. Although many try, managers cannot do it all themselves. So the single most important thing a manager can do is ensure that the team is operating effectively and cohesively. This means that each team member must be operating effectively and collaboratively. Join us on this Webinar to learn some of the fundamentals that you need to have in place. Learn why most managers are not actually managing – how you can overcome this AND ensure that your team members are doing their managerial leadership work. This Webinar will be of interest to all managers in organizations, from the CEO to the front line.